Definition: The act of taking empty looking real estate listing photos and turning them into virtually staged works of art that increase your property awareness and sales without breaking the bank. Requirement(s): Empty photo(s) of your real estate room(s). Most real estate professionals recognize the value of showing a client a fully furnished house or apartment instead of an empty structure. 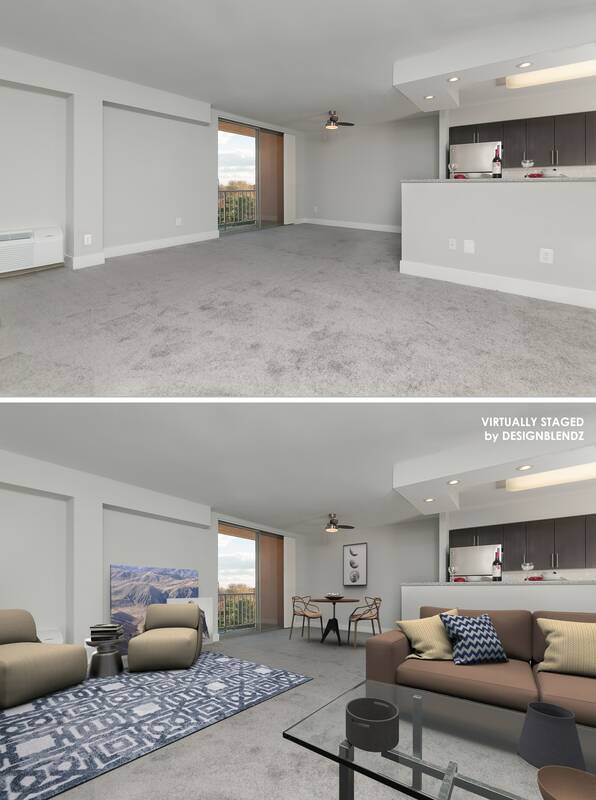 Virtual staging for real estate provides an easy, cost-effective way to bring the property to life and allow your clients to envision living in the home — which can increase the likelihood that they will make an offer. 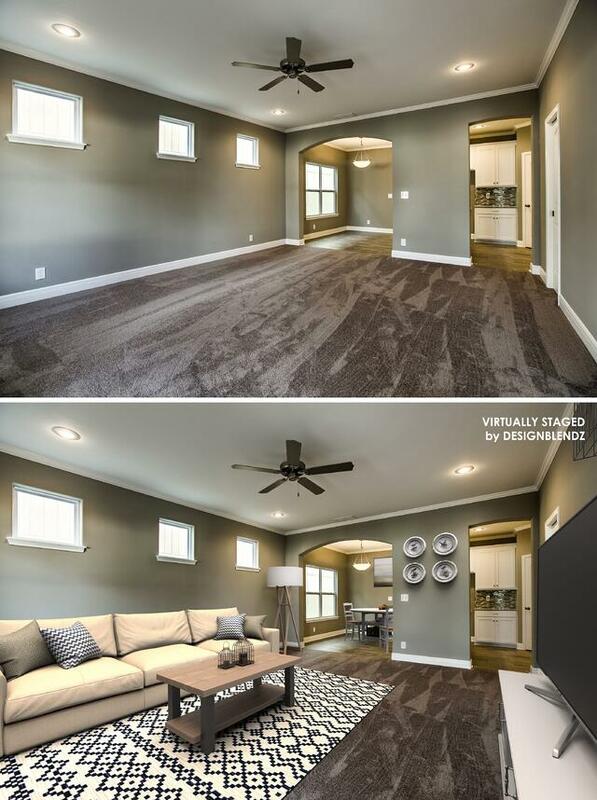 What makes Virtual Staging with Designblendz unique? Accuracy - Other companies use Photoshop, we use 3D Modeling to match your image perfectly. Photorealistic - Just like our renderings, we know how to create a realistic image. Time - Virtually Stage your property in less than 48 Hours! 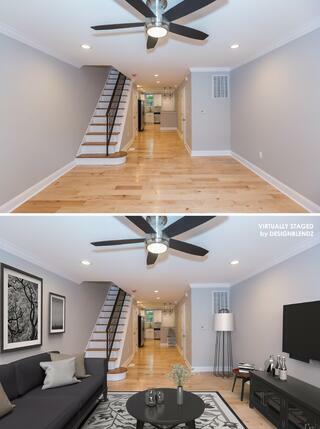 How does Virtual Staging Work? We’ve made our virtual home staging process so easy. Take a photo of your existing space, send it to our team, select your furniture style, let our team work their magic, and receive your virtual staged photo(s). You’re free to make minor revisions to the photos if needed. We do all the “heavy lifting” for you — and it doesn’t require moving a single piece of furniture! Reasons for Virtually Staging Your Empty Real Estate Listings. As 90% of home buyers are starting their search online, you only have a few seconds to catch their attention. Virtual staging enables you to make a strong first impression that will make buyers want to take a closer look and gather additional information about the property. Did you know that 75% of homes that are staged sell faster? Virtualy staging allows you to test the interest of your market. Instead of having the home linger on the market for several months, you’ll draw the attention of more prospective buyers who are ready to make a quick offer. Did you know that 83% of properties that utilize staging services will sell at asking price or above? That’s because the virtual staging of real estate enables buyers to see the true value of the property and increases their motivation to meet or exceed the asking price — before someone else does. The virtual staging of properties helps you avoid the exorbitant cost of acquiring and placing actual furniture inside the home. Why spend thousands when you can save thousands? Photos are available in 5-packs. Bulk discounting applies to large orders. When images are left without furniture, it is much harder to sell a home or lease an apartment. Virtual staging enables you to bring warmth to these spaces. The virtual image will project a “lived-in” look and feel that will make the home so much more inviting. Virtual staging is a relatively new phenomenon that only a few agents and brokers know how to use to their advantage. You will most likely be the first real estate professional to virtually stage a space in your niche market, which will give you an edge over your competitors. Good thing you found us first! Why Choose Designblendz as Your Virtual Home Staging Service Provider? 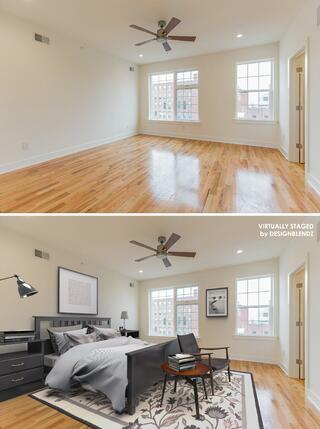 Contact us to learn more about our virtual staging services and get a free quote today!